Honorable chair and members, good afternoon. Thank you for the invitation to attend and speak at this meeting. House Bill 5331 of Congressman Winnie Castelo. Individually and collectively, these measures tell the sad or anger-inducing or patience-snapping stories of many students, parents, workers, farmers, professionals, entrepreneurs, businessmen, or congressmen. If there’s one thing aside from terrible traffic that we all suffer from together, it is the dismal state of internet and telephony services in the country. No one is spared from these horrors that should be preventable and easy to solve. 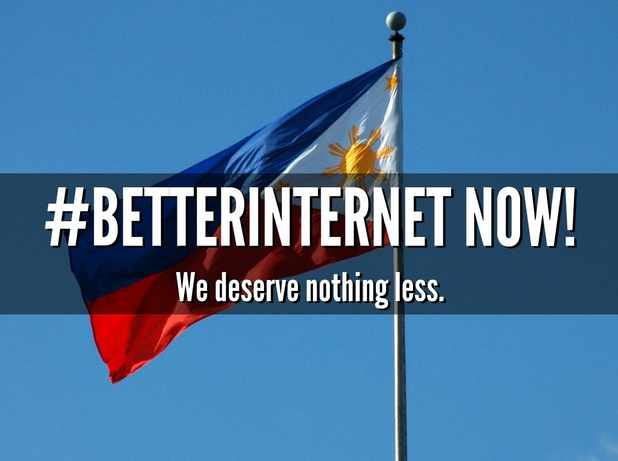 The past few days, we saw the release of reports on the state of the internet and the results for the Philippines are not at all shocking. No meaningful change from 2014. The Philippines still has the slowest internet connection in the region. To the credit of Filipino call center and BPO workers, I think that customer service is not the main problem about internet and telephony services in the country. In fact, all the telcos compete among each other in rolling out ways of receiving complaints from consumers and subscribers. In fact, I could assure you, that the telco representatives here present would try to know each of your personal internet and telephony problems, cut you some slack and solve all of them like magic. They could do that. They have done that. I know because I’ve seen them do it when the attention is so intense especially coming from Members of Congress. In fact, customer service could now be done in a wide variety of means: through the stores, through calls, through text, through websites, through apps and through Facebook and Twitter. The wide variety of customer service points of contact have even led telcos to award themselves awards for outstanding customer service. The most basic problem about telecommunications services is about as basic as definitions and the value government gives them. As far as the National Telecommunications Commission is concerned, the prevailing classification of internet services is that it is merely a “value-added service” of cellular mobile telephone system (CMTS) providers. Even text messaging is merely a “value-added service”. As “value-added services”, these are deregulated or merely left to the whims of CMTS providers or telcos as far as quality of service and prices. The Philippines should do well by looking at how the U.S. Federal Communications Commission recently ruled that internet access is first and foremost a public utility. As a public utility, it is imbued with public trust, should be safeguarded from abuse and that steps be taken to roll them out to the entire country. We cannot tell if goods or services are good or bad if there are no standards. Whether for agricultural products or manufactured goods, standards are important so we would know who provides the good ones and who doesn’t. Soon, we may have Broadband Over Powerlines (BPL). Without established and accepted standards in the Philippines, which are already available in many parts of the world, we cannot judge or measure the quality of services we get and pay for. This situation is bad for everyone — students, educators, workers, farmers, professionals, entrepreneurs, businesses, tourists, and government. One thing that is familiar to all of us here is mobile internet, or internet access through our smartphones and devices. The telcos use a wide range of technologies to provide mobile internet or mobile broadband but there are no standards to measure and judge these services with. One big reason why countries like South Korea, Japan, Singapore and Australia have superior internet services is planning. Governments of these countries predicted and know the rising importance of internet access to their people – whether for education, entrepreneurship, business, tourism, or governance. Connectivity is that important that they laid down policies ranging from access to standards. In the case of South Korea, for instance, the government rolled out policies for the types of internet access to be provided across all classes of subscribers, pushed for innovation on how to do it, and, of course, standards. They planned ahead, worked towards achieving its connectivity goals and so they are now touted as the country with the fastest internet connections in the world. We could also look at Australia which has a National Broadband Network to cover its immense country and connect the scattered city-centers and even most far-away places. We need to have such a National Broadband Network to cover our archipelago. If we think expressways are important, so is the information superhighway. So please seriously consider having a National Broadband Network for the Philippines that would be accessible to all, future-proof and secure — an enabler for innovations in communications, education, entertainment, entrepreneurship, business, tourism, and governance, among others. And it should be backed up by a Department of Information and Communications Technology (DICT). On March 29, 2015, the Philippines marked the 21st anniversary of our first direct internet connection, made from the University of San Carlos in Talamban, Cebu. Imagine that, 21 years. Graduating na po dapat ang PH internet. Sana maggraduate na sa palpak at walang standards na first 20 years. Since 2011, the Philippines has been called the social media capital of the world, with the highest penetration of social media users among internet-connected citizens. In 2014, Makati and Pasig emerged as the world’s selfie capitals. This year, we are expected to reach an internet peneration rate of 60 percent — 60 million people, out of our roughly 100 million population. We now have startups and developer communities waiting to be enabled by faster, world-class and dependable internet. We now have more legacy businesses going digital. Most of our advertising and marketing agencies are going digital. Heck, even government agencies are going digital. I invite you Mr. Chairman and members of this committee to hold public hearings in Makati, Baguio, Cebu and Davao so you could hear from the many stakeholders waiting for your action and eager to offer solutions. The internet is too important to be left to the invisible hand of the market. This hand is good for making money, deceiving customers and establishing monopolies. By the way, Congress still has to pass a competition law or anti-monopoly law. We cannot overemphasize the importance of such a law in an industry such as telecommunications. Mergers and acquisitions, a natural part of business-making, has trumped our quest for better services and limited our choices. The challenge now is to plan ahead. As the adage goes, if we fail to plan, we plan to fail. If we solve our internet problems, and make #betterinternet a reality through definitions, standards, and a National Broadband Network — 60 million people will benefit, including you, your families and especially your constituents. And we would connect the rest of the 40 million and future generations to the information superhighway. These are issues that – any way you look at it – won’t be solved by even the best customer service in the world. Kentex fire: Who knew making slippers is a “killer job”?